Construct a sidewalk along the east and south sides of the roadway. This project will provide a continuous sidewalk to connect TANK bus stops with businesses along Empire Drive. 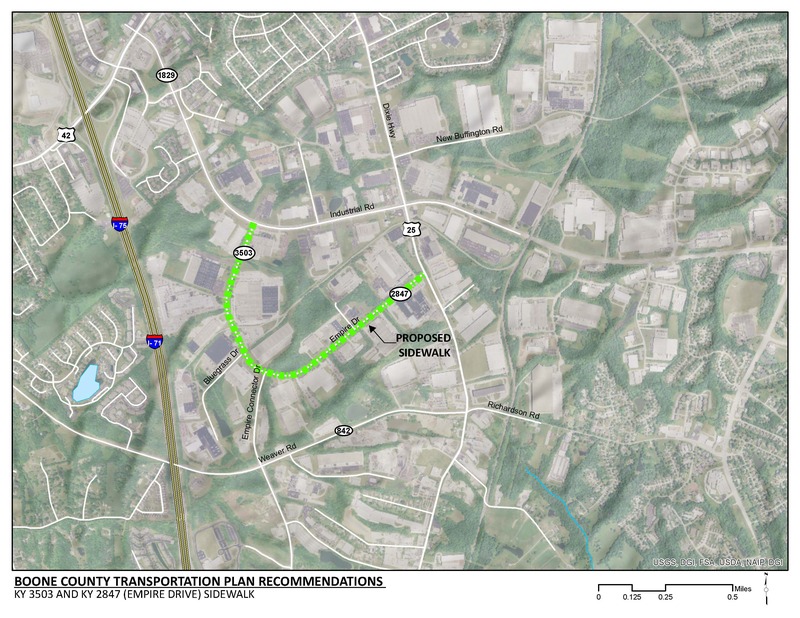 This project supports Boone County’s goal of improving bicycle and pedestrian connectivity and safety throughout the county. Click HERE for a map of multi-use paths in Boone County. There are several overhead utilities that run along both sides of Empire Drive that may be impacted. There are three at-grade Norfolk Southern railroad crossings along the route. Coordination with the railroad will be needed to implement this project. Empire Drive serves several industries along the corridor. Many employees that work at these facilities rely on TANK services for transportation to and from work. By year 2040, employment along Empire Drive is expected to increase by approximately 500 jobs. Within the five-year crash analysis period (2012-2016), there was one pedestrian-involved crash along Empire Drive. There are 13 TANK stops along the route that serve TANK routes 1 and 28X. There are no pedestrian facilities along Empire Drive that connect the TANK stops with businesses. Employees that ride the bus or want to take a walk during work are limited to walking either in private parking lots, grass utility strips or along the roadway.